An Alam being lifted as sign of respect for Imam Hossein during Moharam. "The Iranians are not blessed with the greatest of capital cities", I reflect while strolling late at night with friends, gaining on the 1, 2, 3 - pause of the Moharam drums. "Tehran has facilities...", a friend responds, "yes, but there's nothing defining, no great landmarks, a tourist could skip through Tehran on the way to Shiraz or Esfahan", I interject. Tips of feathers appeared on the road ahead, lit by the street-lights – reds, yellows and greens braking the dull night and guiding us to the proceedings. We continued listing attractions of Tehran as the beat drew upon us – the Azadi Tower – 1, 2, 3 - pause, Darband – 1, 2, 3 - pause. The Islamic calendar had once again afforded us with days off, of which we chose to spend in the city of Arak. Packed six to a car we took it in turns to contort for space as we made the short trip a friend's, friend's historic house. If Tehran struggles to inspire an itinerary then Arak is the rotting corpse of a plan that never took off. We concluded this when we chanced upon the defining crossroad that seemed to double the city's size. It was just past this crossroad that the drum beat originated, encroaching on midnight the streets crawled with the now traditional sight of boys checking out girls, girls checking out boys, boys checking on other boys and girl checking the girls checking the boys. There was the more obvious traditional spectacle of Moharam happening centre to the road – oblivious: the repeated chaining of one's back, the chanting, the lifting of large scaffolding adorned with religious paraphenalia – and there was what went on around it. 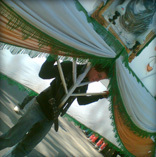 The centre of the road was the man's domain as tradition was observed, squabbling to take the weight of the decorative Alams or in some way assisting in the procession as it slowly rolled down the street, 1, 2, 3 - pause. Arak's lack of anything kept us inside, comfortably hidden from the serious seriousness of these days. We were captured in a period lost to Iran, walled in the historic house once run by a somebody. Excluding us you would struggle to find anything suggesting we'd reached 1980 but mostly we were somewhere in the early 20th century. I kept looking up, mildly entertained by having to stretch the head back to glance the high ceilings. I also sized the house up by trying to reach into a sprint in the hallways and occasionally trying alternative routes to enter a room. I enjoyed the doors that didn't fit, that scuffed on the floor, didn't lock and gapped holes. I stared at the faces that stared at us from the walls – large mustaches, upright gents lined nicely, wholesome beard, military uniforms – all black and white, interrupting the de-saturated tones of the countless rooms. Arak has at least one place for the itinerary, and I reveled in it during every drum pause.